As an Association we’re proud to offer affordable, reliable and comprehensive student insurance & membership for a low annual price, starting at just £4 per student, per year. That works out to around less than 1.1p per day. You can protect your students with £2,000,000 member to member liability insurance covering more than 250 different styles and a range of different types of weapons whilst ensuring their grades and awards are recognised by a leading Association. On top of all this, you can hand them over beautiful PDF or printed certification, professional license books & inner-slips and access to premium websites, services & businesses at no extra cost to you or your student. All from just £4 per year. We’re proud to offer comprehensive martial arts student insurance and martial arts student membership for all of our members. Read on for more information on our cover, membership & what’s included. We’re really proud to offer what’s already known to be one of the industry’s best option for clubs and instructors martial arts student insurance needs. Our martial arts student membership, insurance & licensing includes £2,000,000 member to member liability insurance, full student licensing, student membership, grade recognition, access to our student community, access to a specialist student liaison officer, student analytics reporting, online student registrations, grading books, printed documentation and more. Best of all, as we’re a politics free multi-styled association your group can be covered for 150+ styles and disciplines. Free to register as you please & no pressure to register any students what so ever. Our student registrations are completely optional to help you offer cover and membership as and when you need. No minimum numbers required and packed full of features! Available from just £4 per student, per year! And Why Might My Club Want It? Your students are unquestionably your most valuable assets. From looking at them as individuals through to the numbers and financials their training contributes to the club, it’s really important to do everything you can to keep them coming back. In short, BMABA Student membership, licensing and insurance helps you keep your students safe and their training recognised. It also helps them belong to a much bigger organisation, and enjoy the many perks of knowing their training is recognised at national level. From Public Liability insurance to cover their public liability member to member concerns through to full grade recognition and access to our leading student community, BMABA student memberships combine everything you and your club need under just one price tag. Optional, flexible and starting at just £4 per student, per year. We can also provide student’s personal accident cover to insure them for injuries whilst training, too. You can find out more about what student liability and personal accident insurance covers from this page, a little lower down. As a leading independent martial arts association we’re keen to break away from the excessive charges that burden instructors & clubs when it comes to the necessity of student cover. We combine our student membership to include as standard £2,000,000 member to member public liability insurance, underwritten by Royal & Sun Alliance, AIG & Covea from just £4 per student, per year. This gives you the knowledge that not only are your students a member of your Association but also that they have sufficient member to member cover in place to protect them (and you) should something go wrong during a class. Because we charge one of the lowest rates in the industry (just £4 per student, per year) that leaves you free to charge your club members what you want for their membership allowing your club to recover a small profit to go towards kit or expenses (with most UK clubs charging between £15 and £30 per student for club membership). We can of course provide all of the extras you would expect from us – so if you’d like a high quality BMABA student license / grading book to record progress in you can purchase that as an additional extra at our cost price. You can also purchase trade priced kit or BMABA gi / uniform badges if you’d like to. Likewise, printed certification and additional student extras can be bolted onto student registrations as an ‘as and when’ optional extra. We provide an exclusive BMABA Student portal online free of charge so you can upsell their affiliation to us with yet another free extra and with our free commercial-grade add ons you can collect your student ‘dues’ without any effort whatsoever. Our research indicates we’re the only martial arts association in the UK able to offer instant online student registrations. No waiting weeks for licenses, sending off spreadsheets or posting forms to PO boxes. It’s all instant, secure, online and comes with full e-mail confirmation of successful registrations. Our online system allows you to register students securely 24/7, 365 days a year at your convenience on your tablet, smartphone, computer or laptop. You can customise the registration each time to select the right type of membership for your students & once you’ve securely paid with PayPal you’ll receive full instant confirmation of licensing, registration & insurance. To see the student registration system briefly previewed (in BETA) take a look at the video to the right. 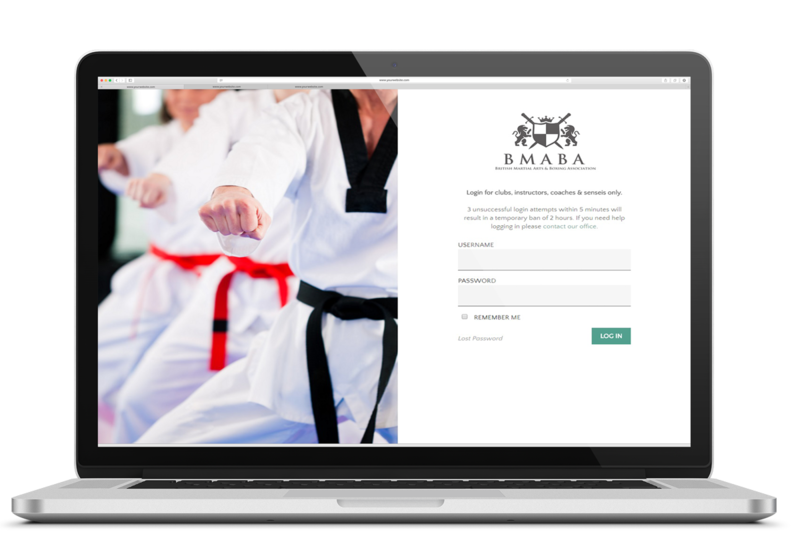 There’s no sound or commentary – just a quick run through to give you a more visual idea of the ease of use the system introduced to your martial arts club’s student registration process. We know that realistically it’s impractical to expect you to register and insure students on day one. Many clubs need to offer trial lessons or taster classes, and even when a student commits it can take a couple of weeks for them to pay any membership fees. We’re proud to offer all premium members of our association completely free 28 day temporary student insurance to ensure you can protect your club and members, even when you’re offering taster classes to new members. During this 28 day period your temporary students will benefit from the full insurance cover offered by our association member to member insurance policy. It’s completely free and you can register students instantly online. You’ll receive instant confirmation so you can register them on the go – even via your Iphone on the night of your class! After 28 days the temporary cover will automatically expire and you will need to either register them as full student members or, if they don’t continue training, you can simply leave it be. A little extra, just for our members so you can confidently continue to offer top notch professional classes for your students. What Does Our Student Insurance Cost? Our costing is designed to be transparent, easy to follow and even more importantly – safe to build your club around. All of our cost in priced on the basis of per student, per year. Our price plans exist to offer clubs of different sizes the opportunity to decide on the additional added extras they feel help them achieve their goals. Which one you choose (if any at all) are entirely up to you. Because of our amazing online student registration system you’re free to pick & choose which option you want for every student. This allows you to create tiers of pricing in your own club or to offer your students the individual choice of a more expensive & fully-featured membership against a more affordable yet basic membership. Best of all, as the instructor you can be sure the key essentials – such as grade recognition, insurance, licensing & membership, are all covered. You’ll receive all of the benefits listed to the left but you won’t receive any digital or printed certification. Perfect if you plan to produce your own in-house documents and just need access to the insurance, licensing, membership & professional services. All of the listed benefits (to the left) plus digital certification. You’ll get a student membership certification, student charter & student inner license (for license books). As per the above, plus the addition of beautiful printed & delivered certification including a BMABA foil & embossed stamp. 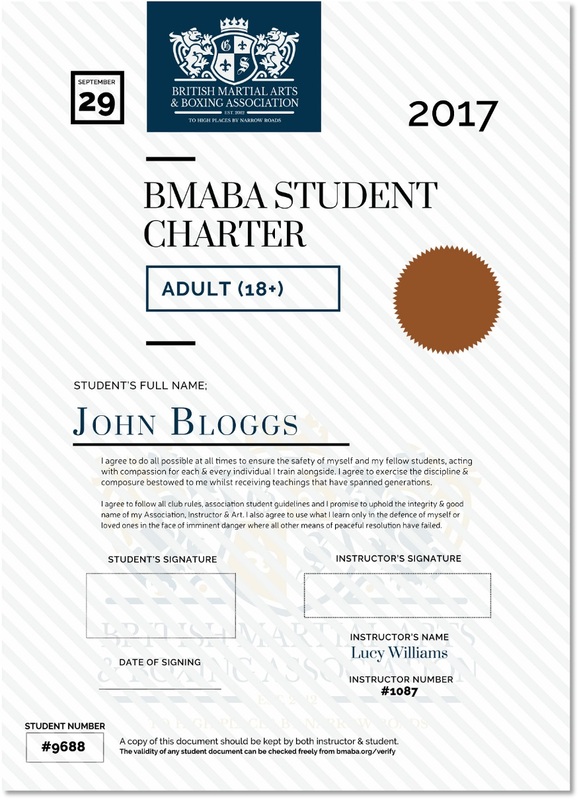 As per the above, plus the addition of an official BMABA license / grading book to accompany your student registrations, perfect for recording progress, grades and club involvement. As per the above, with the addition of an official BMABA gi patch ready to go onto the uniforms, kit or accessories of your students. We can also offer Personal Accident Cover for your students from just £10 per student, per year on top of the above prices if required. Many instructors in our industry get confused about student general public liability insurance offering remuneration should a student injure themselves during training. Public Liability is separate to Personal Accident. We’re pleased to be able to offer competitive student personal accident insurance to help you and your students feel more suitably covered, should you need it. It’s an optional extra so you don’t need to take it, but with prices starting at £10 per student, per year extra for personal accident it’s one of the most competitive rates around. This is just SOME of the disciplines and styles we can represent. The list grows by the day, so if you can’t find a style you’re looking for please just let us know. What Is Martial Arts Student Insurance And Why Is It Useful? It’s important for you as an instructor to understand what is and isn’t covered as part of student liability insurance. It differs significantly to your instructor’s liability cover. Student Liability Insurance (also referred to as ‘member to member’ insurance) does NOT cover your students for personal accident cover nor does it cover them for injuries occurring as a result of direct martial arts sparring or training. When a student is engaged in a class of, say, Jujitsu, then there is an inherent risk assumed by the student when attending and participating in the class. If John throws Larry and Larry sprains his wrist while break falling – all as part of a controlled training exercise – then Larry has no recourse to sue for damages as he must inherently accept this as a possible risk when training. What the student Public Liability insurance (or member to member public liability insurance) is designed to cover is the student’s Public Liability in respect of other persons within the club. If, for example, John does something that causes loss or injury to Larry that is not an inherently accepted part of training then this is where the insurance steps in and protects the student should a claim arise. We include plenty more guidance on these distinguishing factors within our member’s area once you’re registered with us to ensure you’re able to make an informed decision about whether or not it works for you and your club. Our association can offer personal accident insurance for your students at a competitive additional premium should you wish to cover your students for injuries not arising from a breach in Public Liability too. You’ll need to be a member of the BMABA to access our student insurance and membership. You can join us for free. What is Martial Arts Student Membership With An Association? As an instructor you no doubt choose to join an Association to better your club in one way or another – be it insurance, licensing, services, representation or something else. Your students need supporting too. Most of this you can manage yourself but some if it is better left to the same Association or governing body you use – the same governing body you trust. 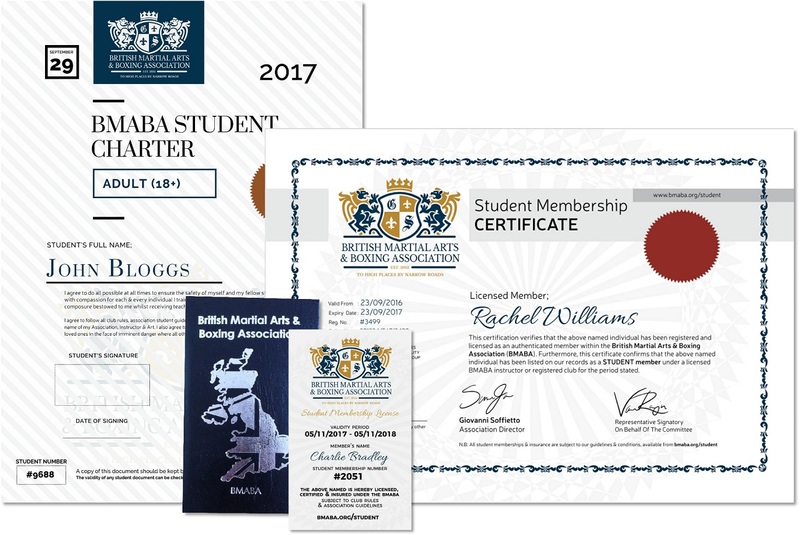 Martial Arts Student Membership provides the student with affiliation to our Association – the British Martial Arts & Boxing Association. With this they’ll be entitled to range of membership benefits only available to those who are student members of our Association. They’ll also access our combined member to member liability insurance, access to premium services, grade recognition and loads more. It helps them feel a part of something much bigger, attacks student drop offs with better retention, helps you show you’re a professional with the backing of a national organisation and much more. Not bad from just over a penny a day? student registered with the BMABA? Exactly what format you receive this certification in will depend on the student membership pricing option you select (pricing is shown above). Basic registration does not include certification, but every option from digital up does include the below as standard. 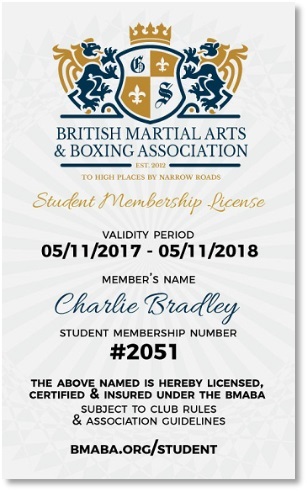 This membership certificate confirms your student is indeed registered and licensed to a UK martial arts association. It states the confirmation of membership passage and also a representative policy number, signifying your student’s insurance under our association’s group cover member to member policy. The student charter helps you bolster your student membership offering and also helps to reinforce the membership with a UK national association. The charter doubles up, offering a declaration of intent from the student in which they agree to assume responsibility for their actions & use their training only when appropriate – a useful reminder to students and a useful tool to help protect clubs too. We also have a junior version of this charter designed for the parent, guardian or responsible adult to sign for those aged under 16. We also include a rather elegant looking student inner license which is designed to fit perfectly into license books (the left example is of course enlarged)! This confirms membership validity and the student credentials, once again reminding them they must follow club and association rules. 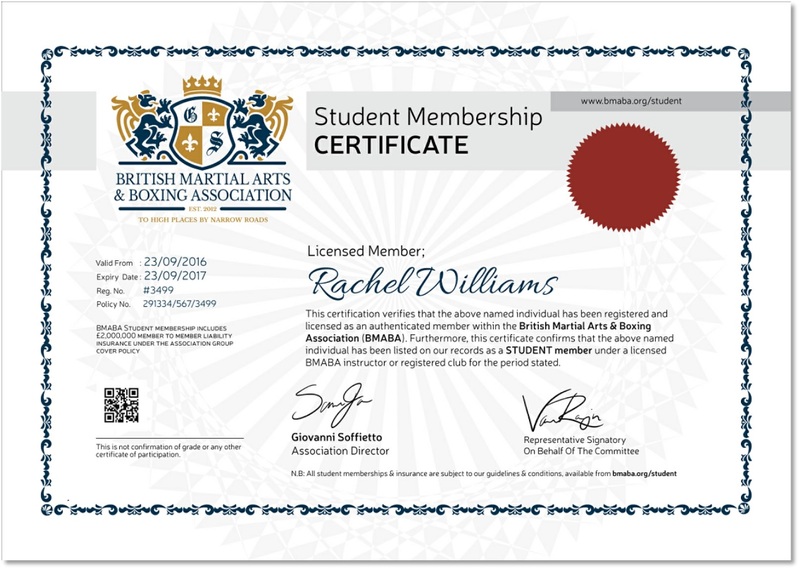 Fancy having a personalised student inner license slip made just for your club? We can set up custom license slips ready to go for every student registration you put through our system for just a small one-off charge. That way you can enjoy a personalised inner slip that’s branded to match your club alongside our recognised student licensing documents. If you choose any student registration option that includes printing we’ll print your inner slips for you too! Your students are exactly that. They belong to your club and as a politics free, independent association we leave it up to you to decide how best to manage them. Our martial arts student insurance is completely optional. It’s there to support you if you need it. You’re not under obligation to register any quantity of students with us. We think that’s the right way to do business. If you want to register students with us it’s on your terms, and our world-class online system, student community, certification, licensing, registration and insurance is on hand ready to make it happen. We know it can be hard to justify your student’s paying out for memberships to your club. To help you add value for money and to help your students develop we have a range of services designed just for your students. From forums, an online community, tutorials & guides through to our new Student Liaison Service, we’ve got a range of freebies to help bolster your club’s student memberships. Our Student Liaison Service, chaired by Senior Committee Executive, Craig Sanderson, is aimed at providing an extra support network to students and helps you provide a better system for resolving disputes or complaints. We know how hard it can be keeping up to date with student registrations. Who’s licensed, who’s expired, who’s graded to where & so on – it’s not easy. It’s also important you know how you’re performing – especially if you run a larger, more commercial club. Our student analytics dashboard is part of every student package, on any level. It offers very indepth month by month and year by year reporting to help you identify when you’re performing well and when you’re not. It also helps identify trends, patterns, gender ratios, renewal vs first term stats & more. All reported in easy to understand, visual graphs. Raw data is provided if you’d like to export the information and run your own visuals too. Alongside this our student register will show you who you have registered, policy numbers, registered grades, expiry dates & more. Simple, precise & invaluable. You can click on different points in the charts and grids to sample data, and there are 3 tabs on the bottom of the frame to explore the different parts of the analytics dashboard. Fancy Registering Your Students With Us? BMABA Student Membership Is Only Available To Our Members. We’d Love To Welcome You Aboard. Am I still free to grade students myself? You’re absolutely free to continue grading your own students on your own terms. There are grading and association guidelines in place to assist you in offering fair, structured & professional gradings, but provided your gradings are safe, ethical & honest you shouldn’t go far wrong. Any guidance or regulation on grading students is in relation to ensuring grades can be ratified – not us taking control of you or your club. All guidelines are simple, fair & open to debate too. 99% of instructors will never take issue with our guidelines, it’s designed to simply catch out McDojos and those who issue ‘certificates for cash’. Our student cover is issued by a group cover policy we hold with our specialist broker. Insurance is underwritten via Royal & Sun Alliance, AIG & Covea. It forms part of our group cover policy. We are not the insurer. Are there any age restrictions for cover? Cover is available for students aged between 4-70 in line with the insurer’s definitions and the policy terms. Do I really get to give access to all those premium sites & services to my students at no extra charge? Your students can access our student community. Whilst registration to our student community is open to the public you’ll need to be a BMABA registered student member to enjoy the full benefits this brings. Services like our student community and student liaison provisions are available free of charge to every student you register. Is there a minimum amount of students I have to put through at any one time? Absolutely not. There’s no minimum or maximum amount so you’re welcome to register students as you please – be that one by one, as they come or in bulk at once. Is weapon use included in the student cover? The policy permits the use of training weapons or traditional martial arts weapons as per the approved weapon list and policy wording. No live bladed weapons are permitted and all weapons need to be inspected for safety prior to use. It’s your responsibility to ensure weapons are safe, fit for training and do not endanger any students under your care. What styles are covered by the student cover policy? We cover more than 250 disciplines and styles via our group cover policy. You’ll see just some of the disciplines covered above. We have a great relationship with our underwriters and brokers, so if you can’t see your syllabus / style shown above chances are if you speak with us we’ll be able to recognise it without issue. We can help them make the transition into instructorship and if you support the move, we can welcome them into our Association as an assistance instructor or full instructor. 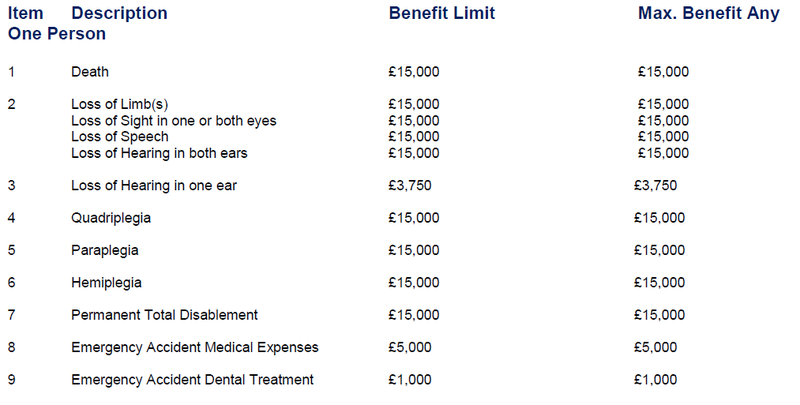 May I see the policy terms and wording that is a basis to this membership and insurance? Yes of course you can. Policy wording, conditions, scope of cover and association insurance guidelines are available on request and online prior to student registration completing. What about extras like printed certification, license books & patches? You can purchase license books, clothing, patches, printed certification and more from our member’s area whenever you wish. It’s secure, online & available 24/7. You’ll need to become a member of our Association to access our martial arts student insurance & membership. It’s free to join us and you can do securely online. Have a question about our student membership?